Apple has acquired well-known and popular automation app Workflow, reports TechCrunch. The deal was reportedly finalized today for an unspecified sum. Workflow, first released in 2014, is an automation tool that can essentially do anything. It allows users to create a variety of workflows to accomplish tasks like creating GIFs from a series of photos, pulling images from a web page, translating an article, posting photos to multiple social networks at once, calculating a tip, and tons more. It is equipped with a built-in Gallery, which allows people to quickly find and use a wide range of automation tasks, and it can be used to create custom automations. Apple is purchasing the Workflow app and the Workflow team, including Ari Weinstein, Conrad Kramer, and Nick Frey, will be joining the company. "We are thrilled to be joining Apple," said Weinstein in a statement. "We've worked closely with Apple from the very beginning, from kickstarting our company as students attending WWDC to developing and launching Workflow and seeing its amazing success on the App Store. We can't wait to take our work to the next level at Apple and contribute to products that touch people across the world. Apple confirmed the acquisition of Workflow, which notably received an Apple Design Award in 2015 for its excellent accessibility features, likely one of the reasons behind the purchase. 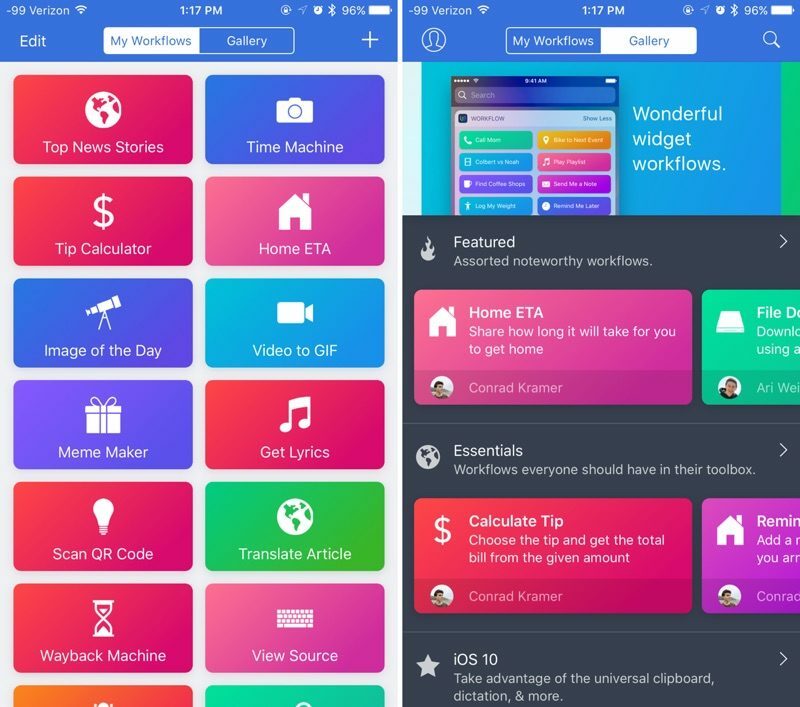 Typically apps acquired from Apple disappear from the App Store, but Workflow will remain available and will be made free starting later today. The Gallery will continue to be updated on a regular basis, as will app integrations. Beyond the app, it is not clear what Apple will do with Workflow in the future, and whether it will be built into future versions of iOS and macOS, but it is definitely a possibility. TechCrunch speculates that it could be used alongside Siri in the future, or perhaps be the backbone of powerful automation tools for the iPad. 1. Workflow is left to die a slow and agonizing death while the team is reassigned to (probably AI-related) projects. 2. Workflow gets superpowered with deeper access to the OS. Here's hoping it's number 2. I'd be curious to see if they'd be willing to acquire Launch Centre Pro or perhaps build something similar to it right into the OS. To me, the combo of LCP & Workflow is a fantastic 1-2 punch. Having Workflow built directly into iOS, especially on the iPad, would be amazing. Hope this leads to awesome things. Not wasting any time are they. So, after Sal Seghosian leaves... is pushed out...? They buy something very like Automator. iOS only? I'd like to be the fly on that wall. "Don’t blame Workflow or Apple for removing Google, etc. actions in last night’s Workflow update. It was lawyers, not strategy. A few weeks ago, Workflow asked all supported apps to sign a simple 1-page contract confirming permission to call our URL schemes. People sue Apple over ANYTHING, ALL THE TIME, so it makes sense for their lawyers to be overly cautious like this in an acquisition. I was a bit put off by the need to review and enter into a legal contract for continued Overcast support in Workflow, but I signed it. Google’s lawyers probably ignored such a “small” request or decided it wasn’t worth the hassle or legal risks, so they didn’t sign. And that’s why you can’t have nice things: not Apple being a jerk, but two sets of lawyers being overly cautious, which is their job." Hopefully, if true, this gets worked out. And sorry for the salt I threw your way, Apple. I still have no idea why people need apps/workflows/calculators/etc for calculating tipping. Actually, I think it'd be even cooler than that. Imagine for a sec that there's something you do over and over again on your phone. The process is the same each time. Workflow recognizes the repetition and can suggest possible workflows. You can then customize those workflows and assign it to a particular command. So instead of saying "Hey Siri, run workflow log my caffeine" you could just say "Hey Siri, log my caffeine. Just downloaded and its pretty neat. Can i somehow integrate spotify into it instead of apple music? If there was a way, fat chance of that happening now! They already removed google maps integration!